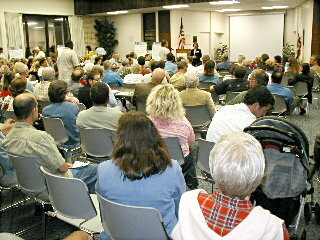 (Oct. 17, 2003) -- Over 200 people turned out on October 16 (a weekday evening) -- causing officials to scramble to provide additional chairs and move tables to handle the crowd -- for the second of two meetings to collect public input on the scope of an Environmental Impact Report accompanying a City Hall favored expansion of LB Airport's terminal facilities. 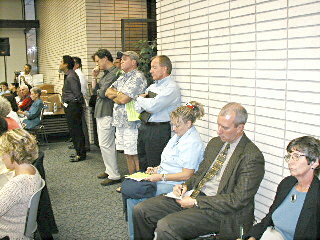 The meeting, at the LB Energy Dept. auditorium (room capacity 250) reached standing room only levels (with tables taking up some of the space). 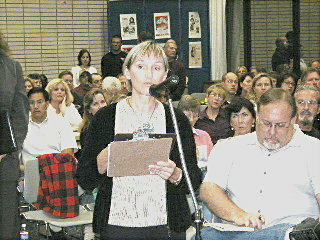 Unlike an Oct. 11 meeting at which officials first tried to channel public comment away from a microphone, speakers at this meeting were encouraged to be heard. A number of speakers -- including the LB Council of the PTA (details below) decried Airport related pollution and insisted its effects be included in the EIR. As currently proposed by city staff (the City Council gets the last word the EIR's scope on or about Dec. 2) the EIR won't include such a study on grounds the expanded terminal facilities won't affect current flight levels. That point was disputed by several audience members who noted that increasing capacity to accommodate 41 + 25 daily flights at 100% capacity could permit two or three times that number much as the current terminal (designed to handle about 15 daily flights) now handles nearly 41/day by running over capacity. 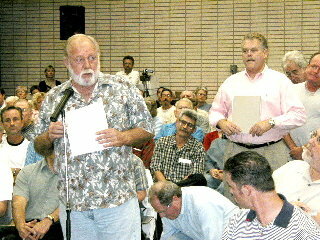 One speaker said, "You are attempting to expand the airport to accommodate what is already an untenable situation. [applause] Expanding the airport to accommodate what we have now...It's going to make a larger advantage to the FAA [and] airlines coming in and saying, 'Hey, you were able to do 41 with what you had and now you ought to be able to handle more flights. We're terrified by this development." Our basis for local control is our noise ordinance which is grandfathered in, and if we increase the size of our holdroom by 5% or 10%, it's my opinion -- again, it's only my opinion -- that's not going to have any basis for anybody coming in and suing to be able to get more flights into the airport. We have to stand by our noise ordinance which is the basis for local control. ...In additional to physiological health risks, the scope of the current EIR must include an assessment of the increased stress and anxiety level in children as a result of pollution related ailments, as well as the impact of high noise levels on their ability to learn. A number of our Long Beach schools, whose PTAs we represent, have reported noise levels so great that instruction must be stopped when a plane flies overhead. In addition, parents report that their children's sleeping patterns are disrupted by excessive airplane noise. Larry Mebust (at microphone, left), an FAA certificated pilot (who doesn't fly jets but has 17,000+ incident free hours) urged that the impacts of diverting large jet aircraft onto alternate runway 25R -- usually used only by smaller aircraft and nearly 3/4 of a mile shorter than main runway 30/12 -- be included in the EIR. Mr. Mebust said City Hall had filed a document [in Dec. 2002] claiming exemption from environmental review for its main runway 30/12 rehab project which didn't mention diverting flights onto runway 25R [a decision publicly announced in Aug-Sept. 2003]. He noted that the current EIR being done for permanent expanded facilities resulted after public outcry over a similarly stealthful use of a CEQA exemption to permit the current "temporary" expanded facilities without public discussion of the impacts. "The city's conduct to date has been despicable in this," Mr. Mebust said. 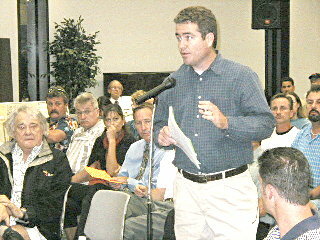 As previously reported by LBReport.com, on Sept. 23, 2003 Mr. Mebust testified at the LB City Council that he considered use of runway 25R by large jets unsafe and described its major impacts. LB Airport Manager Chris Kunze replied that runway 25R meets federal safety standards and is approved as an alternate runway. The Council went on to approve the resurfacing plan 6-2 (Uranga & Webb dissenting, Lerch absent) with the diversions...which will send approaching large jets over a large chunk of the 5th Council district (aligned about a block or two north of Wardlow Rd. from roughly El Dorado Park west to the Airport) with takeoffs skimming rooftops in the 7th and 8th Council districts through Cal Hts. and southern Los Cerritos. This will take place for seven to eight weeks of scheduled Saturdays, plus a year of possible unscheduled flights between 11 p.m. and 7 a.m. Airport management is working to avoid the unscheduled flights. Mebust, a Cal. Hts. 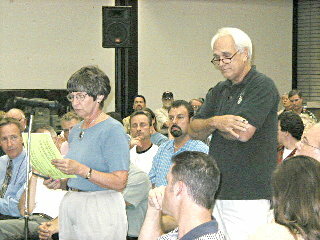 resident, is so concerned about large jet use of 25R that he is building a web site -- www.chnojets.com (Cal Hts. no jets) -- devoted exclusively to the subject. After urging that the EIR include the impacts of diversions onto shorter runway 25R, Mr. Mebust declared he was putting his "money where his mouth is"...and handed a $500 check to LBHUSH2. 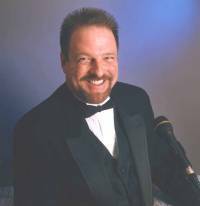 "I hose my patio furniture off every couple of days...Our kids are breathing this pollution. We're maxed out already with noise and pollution [applause] and at nighttime we cannot get a decent night's sleep...We just cannot allow this expansion. I'm scared and I'm tired of this situation and we've got to cut back this airport, not enlarge it. [loud cheers and applause]. 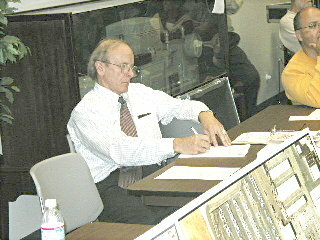 LBHUSH2 president Rae Gabelich, whose grassroots group monitors Airport activities and opposes Airport expansion, ridiculed a proposal by 4th district Councilman Dennis Carroll to create a City Council and Mayor appointed "blue ribbon" advisory committee that would report to another advisory committee to deal with the issues. "I don't think we need another layer of political difficulty," Ms. Gabelich said to applause, adding, "It creates and expands the delay tactics, and we need to have action now and we need to be able to go on with our lives and know that we're protected and our concerns are being addressed." Councilman Carroll, who faces reelection in April 2004, took notes during the proceeding and watched without comment as his proposal (which he has agendized for the Oct. 21 Council meeting) produced some audible displeasure in the crowd. I think we need to recognize the reason we're here tonight, and that is because the City Council has given the Airport Manager the directive maximizing the use of the Airport. That's why we're here, it's plain and simple. We don't need another committee, we just need people who have the ability to say no. 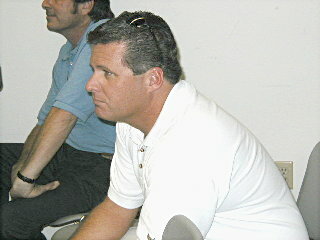 Among those also attending was 8th district Councilman Rob Webb. Also attending but not pictured: 2d district Councilman Dan Baker (with chief of staff Mark Taylor), 5th district Council administrative analyst Tim Patton and 7th district Council chief of staff Ray Pok. City Hall is accepting further public input on the scope of the EIR via email (500 words max, no attachments) to "airporteir@longbeach.gov" and is accepted only through the close of business Oct. 23. Comments will also be accepted in writing (esp. for lengthier materials with attachments) through close of business Oct. 22. Another speaker asked rhetorically, "How do you fight City Hall?" Some audience members shouted "Recall...Recall"...and received applause.